One of our anti touch products which enables you to create a "screen" or curtain in front of an object, display or room which will respond if human presence crosses the screen you have set up. Unlike an active ir beam it can easily be configured to protect awkward shapes or routes. A number of BarrierPIRs would typically be mounted on the ceiling or floor or within the plinth as the second layer of security* behind a white line, rope barrier, raised level or some other form of demarcation. Typically it sounds a buzzer which is normally enough to persuade the visitor to step back or withdraw their arm. The buzzer will then silence. The swivel head enables easy and accurate adjustment and focussing. to protect a wall of (unglazed) paintings. Typically five units mounted every 3m along the ceiling approximately 1m out from the wall and slightly pointing back in. to protect an object on a plinth (see examples below). to protect a large exhibit where damage by touching is identified as the major risk. to protect unusual objects like tapestries. to prevent damage to art on unglazed paintings as used at the Tate. 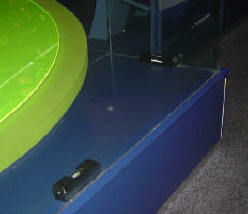 If you look carefully you can see this exhibit is protected by 2 x BarrierPIRs mounted on the floor. 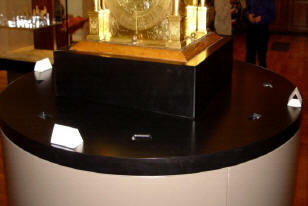 The base of this clock has 8 x BarrierPIRs inserted below the slots in the black plinth. This provides 360deg protection to this historic object. Two BarrierPIRs (painted black) providing protection for a 90deg angle. Ensure the end of line BarrierPIR has the fan closed off on one side otherwise people walking by will set it off. Normally these units are not connected to a radio transmitter as the buzzer is often enough to prevent further risk but if the risk assessment requires then a transmitter is possible as is using two units in tandem thus providing warning and the nearer one an alarm. The current consumption precludes battery power except or very short periods.